What is a SRSLY Safe Home? A “SRSLY-Safe Home” is a home in which the family has committed to providing a safe and substance-free environment for their children, and any other youth who spend time there. Kids and adults can be confident that minors under the age of 21 will not be offered or allowed to use drugs or alcohol while they are in these families’ homes. Families who sign up to be a Safe Home have their name listed on this page and are offered a Safe Home sign to put in their yards. Practically, the Safe Homes list and yard signs let youth and parents know which homes are safe for them to hang out and have fun at without worrying about kids using drugs or alcohol. Safe Homes send a message to the community that parents in Stockbridge want their kids to grow up safe and substance-free, and kids want to hang out and have fun with their friends without being pressured to use drugs or alcohol. Safe Homes are encouraged to display their yard signs at least twice per year - during homecoming week in the fall and right before prom in the spring. 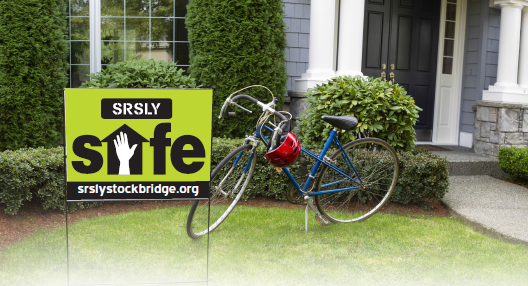 To sign up to be a SRSLY Safe Home, email info@stockbridge.org.